The bathroom is an essential part of our home. More than just a place to clean up, a bathroom can be a sanctuary, an escape for when you need to relax after a long day. When you think about your dream bathroom, you would most likely have an idea of what the shower would look like with the perfect design elements that suit your style. It is essential to have the best shower possible since this is where you start your day, every day. If your shower is not as good as you would want it to be, it may affect how you start your day and be uncomfortable at times. Having a shower that meets your design expectations can do wonders in your daily routine and can be a perfect getaway from all the stresses of your life. With the right design elements from the tiling to the shower enclosure, you can achieve a spa-like experience in your own home. The bathroom shower door is just as important as the shower jets in giving you a relaxing experience when it comes to designing your dream shower. 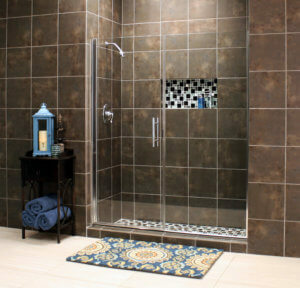 One of the common mistakes in designing a bathroom is not considering the bathroom shower door in the design plan. The bathroom shower door is one of the highlights in the bathroom that will showcase your design taste and style. If you feel like your bathroom shower door does not represent your style preference, here are a few tips for your bathroom shower door replacement to make your shower stand out. When deciding whether to have a framed or a frameless glass for your shower door, consider the overall feel of your bathroom. Custom Frameless glass for shower doors is among the top trends when it comes to bath-room shower designs because it makes the bathroom feel spacious and has a spa-like feel to it. The choice between the framed or frameless glass also depends on your preferred glass thickness and design preference that's why it is important to work with the experts who can transform your ideas into beautiful craftsmanship. One of the factors to consider when choosing the glass for a bathroom shower door is its thickness. For framed glass shower door, a thinner glass with the thickness of 1/4" or 1/2" inch is preferable since the frames will support the weight of the glass. Frameless designs usually require a thickness of 3/8" to achieve that customizable look. Another factor in choosing a glass shower door is the glass finish. A clear glass finish is the most popular style since it offers a seamless design that allows you to display the beauty of the tiles and is a more affordable option. You may also choose from a variety of patterned glass finish designs such as rain, glue chip and aquatex that will suit your taste. Hinges are crucial for the function of bathroom shower doors. You can choose between different types of hinges like the traditional hinge or the continuous type. Once you know the right type of hinge for your door, it's time to choose the right finish that will go with the overall aesthetic of your bathroom design. There are several finishes that you can choose from: chrome is the most popular choice followed by bronze and brushed nickel. Once you have the perfect design choice in mind, the next important step is to find professional glass specialists that offer quality shower glass replacement. Pioneer Glass will help you get your dream bathroom shower by helping you make the right choice for your bathroom shower door replacement. Equipped with years of experience, Pioneer Glass provides superior glass installations dedicated to providing the best customer experience. Pioneer Glass serves the towns of Whitinsville, Northbridge, Blackstone, Douglas, Grafton, Hopedale, Manchaug, Mendon, Millbury, Millville, Oxford, Sutton, Upton, Uxbridge, Worcester, and all surrounding areas including Boston. We will travel to these areas for installation.